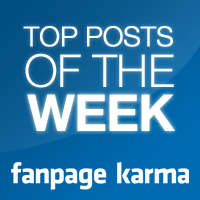 We never had such a clear winner among the posts of the week. The most successful picture of all times on Facebook. It shows Barack Obama in the arms of his wife with the simpel message: “Four more years”. The Social Media Team of Barack Obama conculdes it’s highly successful Facebook Marketing Strategy with this picture. Although the election was among the top topic, other Facebook Pages managed to get their fans’ attention with some interesting posts. Even a post from a very strict oponent of the old and new President’s politics.